Did you know that a refrigerator has the power to make your spare time more interesting and families more functional? A fridge can also give kids a sense of artistic accomplishment - and even help them make some extra cash. They can also use the fridge to horrify siblings and brainwash parents! 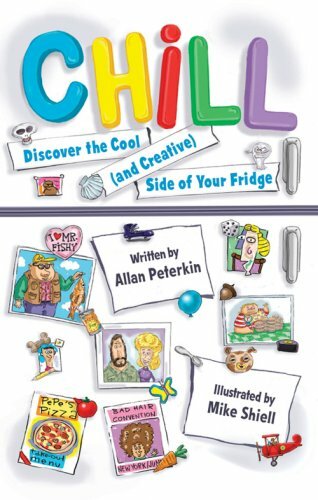 Chill is an interactive guide for kids to make their family fridge the most cool and creative in the universe. This colorfully illustrated book, full of comic-strip sections, cool factoids and out-there fridge psychology, includes a history of refrigeration, instructions on how to create special-occasion fridges, 101 things to put on your fridge, the Five Taboo Fridge Behaviors, how to create a fridge art consulting business, crafts, quizzes and games and more. Chill will keep the whole family coming back to the refrigerator again and again - and not just to rummage for snacks. About Allan Peterkin (Author) : Allan Peterkin is a published author of children's books. Published credits of Allan Peterkin include What about Me? : When Brothers and Sisters Get Sick. About Mike Shiell (Illustrator) : Mike Shiell is a published illustrator of children's books. Published credits of Mike Shiell include Chill: Discover the Cool (and Creative) Side of.